As we identify ways to maximize our impact, we look to and support research and data analyses to inform our approach. We want to share valuable studies and information to foster learning, so that together, we can continue to enhance the vitality of the region. The nonprofit arts face an environment that challenges their continued growth and raises the prospect of future consolidation. Focusing on the relationship among the components of local communities' "arts ecology," this research develops a new framework for evaluating systems of support to the arts. It draws lessons from Baltimore, Boston, Charlotte, Chicago, Cleveland, Denver, Detroit, Minneapolis, Philadelphia, Phoenix, and Pittsburgh. 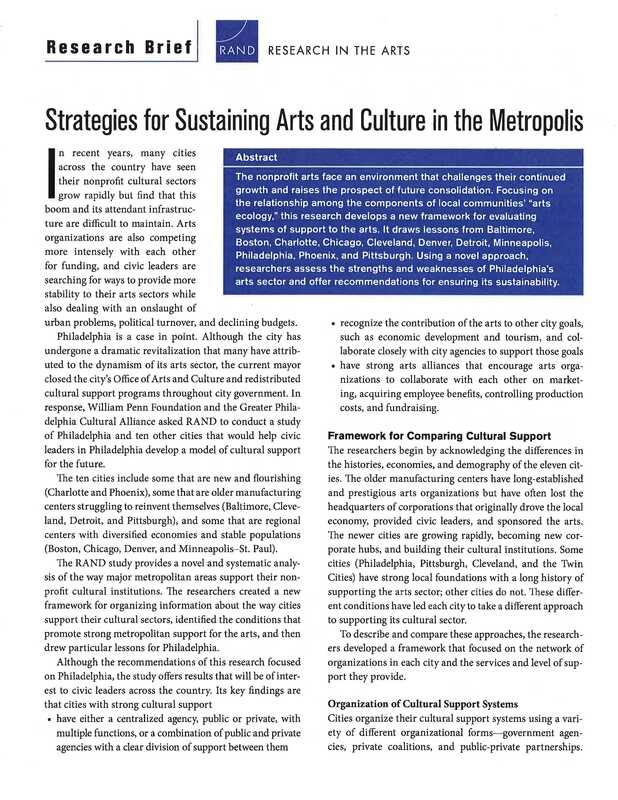 Using a novel approach, researchers assess the strengths and weaknesses of Philadelphia's arts sector and offer recommendations for ensuring its sustainability. Transatlantic Cities Forum: Re-Envisioning Philadelphia's Industrial Spaces originated with the participation of Philadelphia in the Transatlantic Cities Network, a network of 23 U.S. The nonprofit arts face an environment that challenges their continued growth and raises the prospect of future consolidation.